How do I get started with SolarWinds IPAM? If you are installing IPAM 4.6 or later, see the instructions for the SolarWinds Orion Installer. If you are managing more than 250 IP addresses, use SolarWinds IPAM to automate address management and avoid IP conflicts. Integration with DHCP and DNS: gain visibility and control with smart IP address and multi-vendor DHCP and DNS management. Roles and permissions: delegate IP administration so systems and network admins can manage their own range of IP addresses. Alerting and reporting: gain access to real-time data about your IP addresses statuses. Manage change and fix problems faster with IP discovery, alerting, and reporting. IPv4 and IPv6 management: manage both IPv4 and IPv6 addresses from a single platform. For a stand-alone installation of SolarWinds IPAM, install the product on a dedicated server. The dedicated database instance is for IPAM use only. This installation assumes you have not installed any other SolarWinds Orion Platform products on the target server. 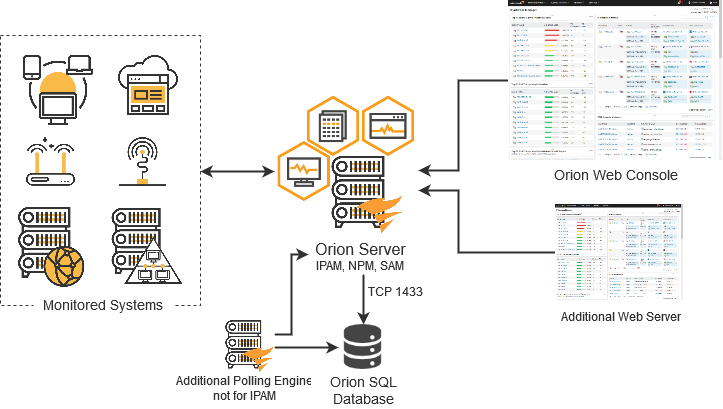 SolarWinds IPAM supports an integrated installation into an existing Orion Platform. For this installation, you can install the product on the Orion server to connect to the Orion SQL database. As part of this installation, you must verify if installed products need to be upgraded prior to installing SolarWinds IPAM. If your environment uses SolarWinds High Availability, follow the additional instructions as part of the installation. SolarWinds IPAM supports an evaluation installation with a trial period. This installation is a full installation of the product with a 30-day license. To continue with a full product license, contact SolarWinds Sales. The following terms provide context for the architecture and components of SolarWinds products. See the abbreviations article for a list of all acronyms and abbreviations used by SolarWinds. Orion main polling engine: The main server you install your Orion Platform products. In the Orion Platform environment, you will have a single main polling engine. With a license for SolarWinds High Availability, the main polling engine will be in a pool with a primary and secondary server pair. Also called the main poller. Orion Platform: The common backend platform used by the Solarwinds Orion suite of products, including NPM, SAM, NCM, NTA, and more. The platform provides the backbone for navigation, settings, and common features like alerts and reports. It also provides a consistent look-and-feel across products, giving you a “single pane of glass” for your Orion monitoring tools. Orion Web Console: The web interface you see when you log in to Orion that is used to view, configure, and manage all of your monitored objects. Orion Application Server: A Windows server that runs the Orion Web Console and collects data from monitored objects. Also called the Orion Main Poller. Orion Database Server: A Windows SQL server that should be hosted on a dedicated server in a production environment, separately from the Orion Application Server. It stores Orion configuration data and all collected performance and syslog data. Scalability engine: Provides additional web servers (AWS) to scale your environment. These options also include stacked pollers with additional polling engines on the same server. For more information, see the Scalability Engine Guidelines. Scalability Engine Installer: Installs the SolarWinds product on additional web servers (AWS). This installer is light-weight and accesses the main polling engine to determine products and versions to install on the server. Use this installer in place of the larger bundles. For details on the installers, see the Scalability Engine and Bundle installer article.